Two years ago Stevie Nicks released her eighth solo album 24 Karat Gold: Songs From The Vault, to critical and commercial success. Online music database All Music dubbed the re-recorded set of demo songs ‘the best sounding record she (Nicks) has made since 1983’s The Wild At Heart’. Fast forward to October of this year, where Nicks alongside her band and talented friends Waddy Wachtel (whom she met in the pre-Fleetwood Mac days of 1973) and backup singers Sharon Celani and Lori Perry (backup singer for Nicks since 1981) embarked on a 27 date 24 Karat Gold Tour in support of the album by the same name. Now in the final stretch of the 24 Karat Gold Tour, Nicks found herself in Vancouver’s very own Roger’s Arena. Entering the converted hockey arena wearing a flowing but subdued black dress, Nicks let her accessory scarves do the flashy work for her on round one of her ever-shifting stage attire. The 68 years young Nicks has had no problem maintaining a legion of fans since her Fleetwood Mac debut 41 years ago alongside then partner Lindsey Buckingham, and this latest stop-off in Vancouver was no different. 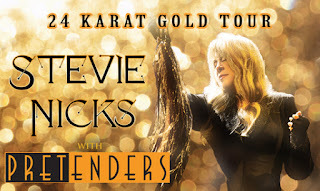 As with all of her prior 24 Karat Gold Tour stop offs, Nicks’ opened the night with “Gold & Braid”, “If Anyone Falls”, and “Stop Draggin’ My Heart Around”, respectively. The tambourine-wielding Nicks was joined on stage by The Pretenders front-person Chrissie Hinde for “Stop Draggin’ My Heart Around”, as she has nightly this tour.Whatever nostalgia felt by the crowd for having witnessed Hinde open the night with The Pretenders followed by Nicks headlining the very same stage was trumped by the sight of the two powerhouses of rock sharing the spotlight at the same time. It can be argued that the career of the 1998 Rock n’ Roll Hall of Fame inductee Nicks has nothing left to prove. Though looking at Friday’s show as a snapshot, ignoring the over 40 top 50 hits, or the 140 million records sold Nicks was at times underwhelming. The same fans that would sell Friday’s Stevie Nicks show as being ‘timeless’ or ‘flawless’ were among the many frequently checking their watches and peering about disinterested. Though social media has largely dusted golden praise over the ‘reigning queen of rock ‘n roll’, what has widely gone underreported was the audio quality at Roger’s Arena Friday night. Early in the performance, the unaddressed concern about an audio mix saw long-time friend, touring guitarist, and backup singer Waddy Wachtel’s vocals overpower the conventionally (thought of as) powerful voice of Nicks. Tough to ignore for some, perhaps due to nostalgia many fans in the building seemingly did just that. However, it was not just a poor mix in the building responsible for a repetitive vocal tone that one wouldn’t quickly attribute to the legend had they not been there to see Nicks live. Was fan-nostalgia to blame for the level of absurdity that came with the overjoyed cheering Nicks received simply for twirling in a circle? A move the artist has no doubt mastered since she could only pronounce her own name as ‘Tee Dee’, the origin of how Stephanie became ‘Stevie’ Nicks. Does this same overjoyed audience react with similar vigour when their three-year-old spins in the living room? At the age of 68 and nearing the successful completion of an impressive tour, Nicks should be afforded some grace. The twirl move that was once saved for the crescendo of “Rhiannon” was in the defence of Nicks, resurrected due in part to her role as the White Witch on FX Network’s American Horror Story: Coven. Moreover, the move was often emulated by fan favourite character Misty Day, who played by Lily Rabe was infatuated with Nicks in the show. After all, the public perception of Nicks has always been the rumoured witch’s most powerful spell. Numerous adulterous relationships, marrying her recently deceased best friend’s husband, multiple addictions and interband dramas have been the catalyst(s) to many an artist’s demise professionally; at least a dissolve in public opinion; not so, however for Stevie Nicks. As evidenced Friday night, Nicks can twirl into the environmentally superconscious city of Vancouver wearing a fur jacket from head to toe, and not a peep of recreational outrage is heard out of the usually aghast (at such behaviour) Lotus Land. The verbose and often erroneous explanations resulting in very little new information that took place between songs would be considered by any other artist to be the ramblings of a musician seeking relevance in the twilight of their career. With Stevie Nicks such long-winded loquacious tails were merely regarded as charming anecdotes. What can never be taken away, however, is the ability of Nicks to write masterpieces both lyrically and musically in her songs. The pursuit for relevance need not extend beyond the innate ability Nicks has to write beautifully accessible music. With the sensitivity of Nicks to capture emotion even decades after having originally penned (the piece), the integrity of her song writing was never once lost Friday Night in Vancouver. Whether the Reigning Queen of Rock n Roll continues to go her own way post 24 Karat Gold Tour, or she picks up the pieces to go home; the landscape of music will forever be changed for the better thanks to the enigmatic sorcery of Stevie Nicks.